On Cleveland’s north coast, we are blessed with a great Great Lake – Lake Erie. Known worldwide as one of the best places to watch a beautiful sunset, it’s a place you want to be after dinner. Unless you own your own boat however, the viewing areas are usually limited to shoreline locations. Venture just an hour west to Put-in-Bay, and there’s a whole new game available however. How does a private sailing experience on a luxury vintage 38-foot tugboat strike you? Way cool without a doubt. It’s called “Restless,” and instead of pushing freighters up the Cuyahoga, it will take you (and up to five friends) on an unforgettable hour and a half cruise around South Bass and Middle Bass islands. The fare is $65 per person (minimum 2 persons) and light refreshments are included. “Restless” is truly elegance afloat. From the beveled glass windows to the historic 1800’s binnacle (compass), every element of the ship is done with style. This would be perfect to impress a date. It could be a great afternoon of fun with your family or a few friends. Or as a corporate perk, it would be hard not to impress that special client. It’s interesting that this ship was originally built in 1938 as a prototype tug for the Army Corp of Engineers. The Corp decided on a different design, and this tug was then sent off to storage. Finally a boat collector obtained the vessel, added the aft cabin, head and sleeping quarters and retrofitted it with many items salvaged from a Great Lakes freighter. 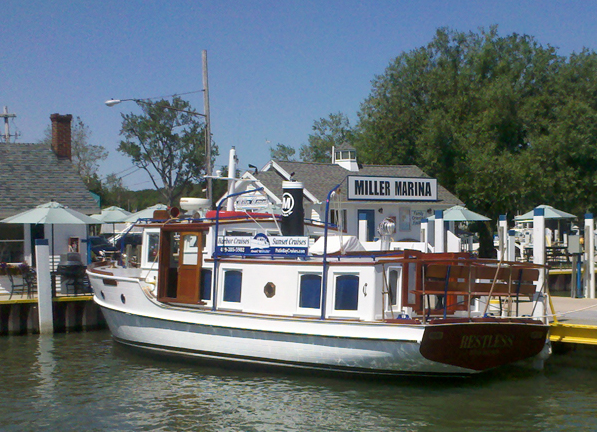 The ship was finally obtained by Scott Market, co-owner of Miller Boat Line. This fifth- generation Put-in-Bay resident found the boat in Sturgeon Bay, Wisconsin and knew it would be a perfect complement to his Miller Marina on Put-in-Bay. To make reservations, call Scott at 419-285-5902 or check their website at www.putinbaycruises.com.